Imagining what school can be. In his post on the voucher system, I enjoyed Seth’s utopian vision of the diverse learning environments that could emerge if every child were backed with no-strings-attached, government funding. I could imagine children defining their current curiosities (e.g., the history of soccer, cooking, dance, or bicycle repair) and then logging onto a website where they could search a list of funded mentors in their area, as well as be able to find reviews from past learners and parents. The mentor-based, mini-schools would be paired with “real” teachers. The many hard-working, well-trained teachers from our existing moribund education system would be selected by the kids during the off-hours of the mentorship to refine their standard skill-sets of math, English, biology, etc., all tailored towards the context of their mentorship. The mentorships, paired with the more standard academic subjects, would comprise a decentralized system of project-based learning. My recent experiences, here in rural India, brought to life some of the benefits and challenges of creating a rich project-based learning environment. A few weeks ago, I returned to spend three weeks at the creative and chaotic Adharshila Learning Center, which I blogged about last October. I worked primarily with about 20 students in years 6 and 7, building a small biogas plant (biodigester), and renovating some of their solar-powered lighting systems. These projects were not just about education, but were chosen to address economic and environmental challenges at the school. The biogas project was motivated by the ongoing costs of buying firewood for cooking, using non-sustainably harvested wood. The lighting project was needed because the school’s power from the main grid is limited and unreliable. Over the course of three weeks, the students learned how to build and operate a biodigester and deepen their knowledge of electricity and solar power, while improving their English, math, and science skills. There are close to 100 students at Adharshila, and the school sits in a heavily deforested, arid location. Currently the school purchases firewood from a nearby town, and cooks most of their meals on several wood-burning stoves. Our biodigester was comprised of a large, sealed tank that could hold a mixture of water and organic matter. Inside the tank, anaerobic bacteria decompose the matter and produce a mixture of methane and carbon dioxide (biogas) that can be used for cooking. The biodigester only took a day and a half to build, but a number of smaller projects emerged during the process. The children spent several days weighing the amount of firewood used to cook their daily meals, and characterized the various organic waste streams on the campus. “Waste” is scarce at Adharshila; food leftovers go to their three cows, whose dung goes into the school’s organic farm. None of the charts and tables that we found on the gas production from different biomass sources correlated well with locally available materials and the area’s hot temperatures. We therefore embarked on a small experiment to determine what mixture of inputs would be the most economic. The kids built seven mini-digesters with carefully weighed biomass inputs, hoping to get rough estimates for biogas production rates. We reviewed how to measure volume, read measurements (always at eye-level), and stressed the importance of recording observations. 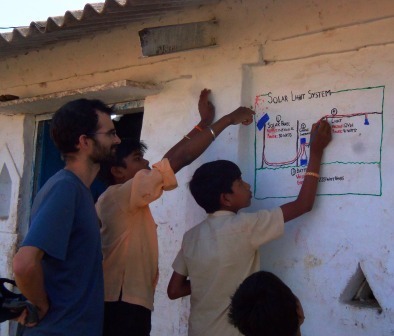 It was easy to incorporate the biogas and solar projects into the children’s curriculum. They compiled a long list of new words in English, and practiced responding to questions about biogas and solar in complete sentences. The older students learned how to calculate the volume of a cylinder in order to estimate the gas inside the tank and solve an equation for an unknown variable, while the younger students practiced algebra with decimals. During both the biogas and solar projects, I’d typically have a group of three to ten students busily working alongside me. It became interesting to note which learners were constantly involved, which ones would show up for spurts of time, and which ones would steer clear of the hands-on activities. During the solar installations we decided to paint descriptions of the systems on adjacent walls. Suddenly there were students offering to help who hadn’t earlier been interested, illustrating how various project components can capture the curiosity of different children. I also wondered how the process, rather than the content, attracted the learners’ attentions. Some of the younger kids, whose English and science skills were very basic, as well as one child who was very good at math and science, independently built their own mini-biodigesters. After spotting their private experiments nestled at the foot of nearby trees, I wondered whether the group process had been too fast or too slow or too participatory for them, not giving them enough space to explore in their own ways. We all have both natural and conditioned inclinations in the way that we learn. The head teachers were able to caricature tendencies that they had observed in some of the kids. “He is more interested in the intellectual aspects, but much less likely to contribute to the manual work”, or “His attention wanders very quickly if not under constant guidance.” Access to a diversity of projects, especially those that are self-designed, creates the potential of letting young learners discover and cultivate their interests. The past several weeks gave me the opportunity to re-evaluate my own learning tendencies, as well as my motivations to teach. Experiential learning is a huge personal motivator for me. I love to learn, and I learn best by doing. It has now been almost three years that I have been reading and making design calculations about biodigesters, yet I had not gotten a chance to build one. I was also quickly reminded about the stark contrast between mentorships and class-room teaching. Working with a handful of interested learners is rewarding and fun. Trying to motivate a large group of disinterested ones is another story. Effective classroom teachers are typically both good managers and performers. When I was tasked with getting all of the kids actively involved (when we built the mini-biodigesters, for example), I observed a clear internal conflict. Seeds of frustration arose from wanting the kids to be interested in doing what I wanted them to do, and then becoming angry at myself for being hypocritical. I love being motivated by my own curiosity, so why should I try to get the kids to be otherwise? Lack of experiential learning opportunities is an unfortunate trait of the classroom-based model of education. The typical curriculum trains us to try to understand reality through a simplified representation, using words, numbers, and pictures. Rich and important details only become revealed once the toy-problems take their places in our complex social and natural environments. However, both experiential and abstract learning are important and complementary. A project-based curriculum creates the opportunity for emphasizing them both. A decentralized pairing of mentorships with academic skill-building has two additional benefits. It creates the potential for the children to make a self-designed curriculum, and opens the door for passionate learners, like myself, who are turned off by standardized curricula and class-room management, to share our learning journeys with youth. As I was riding in a bus, returning to Adharshila with solar equipment, two boys engaged me in conversation. It turned out that they were both engineering students in their last year at a local college, and one of them was about to build a mini-biodigester for his final project. When he found out what I had been working on, he began peppering me with questions. I couldn’t help but smile, thinking that a group of 12-year old village kids would have been able to answer most of them. I was happy to know that this engineer would soon get his hands dirty with some experiential learning. From the heart in India: Service, learning and love. What does “school” look like when we throw out the grades, the classes, the teachers (the competition, the tests, the authority from above)? This one-of-a-kind organization in India offers a compelling picture for what learning could be. From the heart of India, a pedagogy that attempts to balance college fantasies with the reality of a subsistence-farming life. Students in the garden at Adharshila. You are currently browsing the Models from India category at School Re-formed.